Midsize companies are perfectly positioned for growth, but success in this area boils down to two powerful endeavors: investing in your people, tools, and technology to encourage productivity and innovation, and making better data-driven decisions. This confirms the importance of modernizing and continually improving accounting processes, and according to The 2015 BlackLine Survey of Midsize Executives, too many manual steps and a lack of automation are causing the most issues. 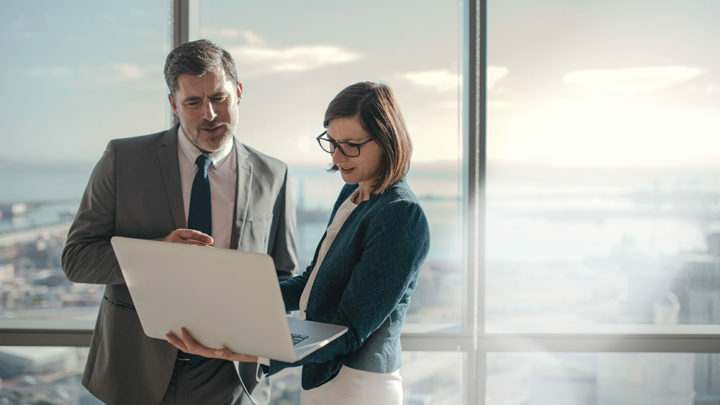 The financial close is one of the most critical financial processes, and through process automation, can deliver the real-time data that midsize executives need to make more informed decisions based on data. Yet only 20% of accounting and finance professionals are “very satisfied” with their current closing process, and only 28% completely trust the accuracy of their financial reporting data. [i] These numbers are the results of the Process Automation in Accounting and Finance 2016 IMA Survey, and they are frighteningly low, given how integral this process is not only to accounting and finance but to the broader business as well. It’s no wonder—manual closing methods are extremely time-consuming and error-prone. The more manual processes, the longer the close will take, and this is why automation is so important. The traditional way the record to report process is done is equivalent to unnecessarily choosing the steep, uphill path over the mountain when there is a much flatter, finance automation path that cuts right through. BlackLine’s survey found that 36% of midsize executives have automated the majority of their financial close and reconciliation process, but this means that 64% are still stuck in the spreadsheet Dark Ages. [iv] For those companies, the four procedures identified as requiring the most time and effort, and therefore the best candidates for automation, are balance sheet account reconciliations, variance analysis, bank and credit card reconciliations, and journal entry creation. Automation can have the greatest impact on these very time-consuming manual processes, and beginning to gradually automate them helps midsizeorganizations to improve accuracy, increase visibility, and streamline the audit process. It also opens the door to a new operating model for accounting and finance teams called Continuous Accounting. The majority of accounting processes are still most commonly performed on a monthly basis, and this is an opportunity for additional automation to enable Continuous Accounting. A Continuous Accounting approach embeds automation, control, and period-end tasks within day-to-day activities to create a shift in the way that the bulk of the accounting work gets done. Instead of waiting until the end of the period, these operations are performed on a more frequent basis, to smooth out the end of period spikes. This immediately boosts productivity through innovation and allows accounting and finance to move from the traditional reactive model to finally becoming proactive, and deliver accurate information in real time. Continuous Accounting accentuates the most significant benefit of streamlining the financial close—freeing up time to focus on strategic initiatives that can help grow the business. [v] On average, the full financial close takes more than seven days, with much of the time spent on collecting, entering, and validating the data. Automating these tasks could free up days of accountant’s time for value-adding activities. Accounting and finance professionals in midsize organizations agree that automation is a significant improvement, and 50% believe that achieving greater efficiency is imperative when evaluating accounting solutions. This further illuminates the disconnect as 24% still do not intend to automate their financial close process. [viii] There are a variety of reasons for this, ranging from the need for better IT systems, more staff, and new accounting systems to management buy-in and training. But the evidence of the benefits of finance automation is undeniable, and companies that are slow to modernize are at a competitive disadvantage. Some solutions can be integrated with almost every ERP out there—some can’t. Find a financial close solution that works with multiple systems to ensure your independence from any one ERP. Don’t just transfer resources from one department to another. What’s the point in saving resources in accounting with an automated solution only to find them diverted to IT to manage that solution? Look for a system that is easy to implement and one that also doesn’t require ongoing resources from your IT department. Implement a solution that’s intuitive and user-friendly. To ensure user adoption— and a positive ROI on your investment—the solution must be intuitive and easy to match to your existing workflows, yet powerful enough to perform complicated accounting and reconciliation tasks behind the scenes. Make sure it’s organically developed, not “cobbled” together. Everybody loves to say their software is integrated, but few truly are. A solution that’s been built seamlessly from the ground up is key to ensuring an easy integration with your existing ERP, a better experience for users, and continual updates and improvements to the software. Opt for a cloud-based solution. If you value innovation and productivity, investing in your people, tools, and technology, and empowering your executives with real-time data to elevate their decision making, then it’s time to adopt a continuous improvement mindset and begin automating your financial close processes. We’ve given you the steps to determine the right solution for you. Now it’s up to you to begin.